The western is a staple of the movie history going back all the way to the first days of cinema. There have been many tales told through the setting of the western, some true, some fictional and while they have all been different takes on that period of American history, they tend to ignore the obvious fact of that time, many of the so-called cowboys of that era weren't white but black and even with the victory of the north in the Civil War the black people still faced many hardships and oppression during this time. Posse tells the story of a group of black infantrymen enlisted during the Spanish-American War. Mario Van Peebles stars as Jessie Lee, the leader of the 10th Infantry division. Billy Zane is Colonel Graham, a vicious and politically motivated commander who takes complete joy in reminding Jessie Lee and his men that they are not as "good" as their white counterparts. Graham orders Lee and his soldiers to run a raid on a caravan carrying a large amount of gold; they are to dress as civilians to avoid any consequences with the Brass. The raid goes off without a hitch but Lee quickly realizes that it was a set-up to make the Colonel look good at the expense of 10th. Lee and his soldiers make off with the gold but not without making a permanent enemy of Colonel Graham along the way. They are able to sneak across the border by hiding in the crates of dead soldiers and find themselves back in the U.S. Upon their first night back they make the most of their new found freedom. Jessie Lee on the other hand has different plans. Through a series of flashbacks we learn that his father was a preacher who taught that the way to progress wasn't through violence but with education. He was lynched by some white men who didn't agree with his way of thinking while Jessie was forced to watch. Now that Jessie has returned to the U.S. he has revenge on his mind. His fellow soldiers wind up tagging along when they realize that Colonel Graham is on their trail. They eventually find their way back to Freemanville, Lee's home town, and are surprised to see it has become a shadow of what his father dreamed. Now run by Sherriff Bates (Richard Jordan) the townspeople are essentially oppressed into living out a life of greed, prostitution, alcoholism, violence and murder. Lee is upset about this. When Colonel Graham arrives and joins forces with Sherriff Bates Lee realizes it is time to stand up and put an end to the devastation that has been wrought upon these people. The films messages is quite clear, that while most of know the history of America there is a hard truth that we often ignore. Americans once enslaved and oppressed an entire culture thinking ourselves superior. When we granted them "freedom" it was only in a legal sense and even then it was a long time before something resembling true equality was achieved. The acting is pretty heavy handed, most of the actors in the film are not veterans of the screen and it is obvious through their performances. On the other hand it does boast an impressive cast consisting of such names like: Big Daddy Kane, Isaac Hayes, Stephen Baldwin, Tone Loc, Melvin Van Peebles, Blair Underwood, Pam Grier, and Tommy "tiny" Lister. Now on Blu-ray the film looks really sharp, highlighting all of the natural beauty in the surrounding landscape of the Midwest. Surprisingly there aren't any extras that come with the Blu-ray, which is a shame because it would have been interesting to learn a bit about the thought process that brought this movie together. Still the film looks quite good via Blu-ray with Widescreen 2:35:1 and 2.0 Surround DTS-HD Master Audio, Spanish Mono, and French Dolby Surround. 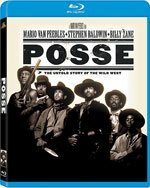 Posse takes the classic western tale and turns it on its head by reminding all of those who watch it that while we pride ourselves on being the most diverse country, it did not come without a price. Download Posse from the iTunes Store in Digial HD. For more information about Posse visit the FlickDirect Movie Database.